A walk around the lake at the National Trust Property at Clumber Park. As Larry, one of the "Boys", reckons the best part of this website are my photographs (and some of his), and as this walk is very straightforward, words will be kept to the minimum. 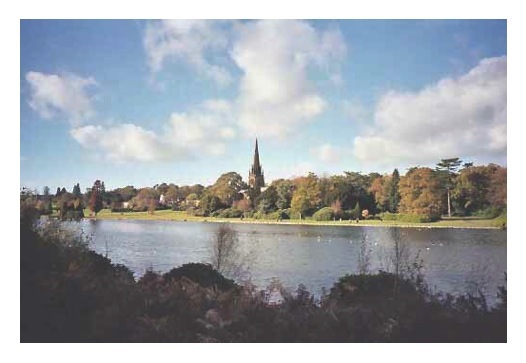 View of the lake, trees and top of Clumber Chapel. Back in November 2002, Anne and I visited the East Retford Hotel at Retford, which is located in Nottinghamshire, north east of Mansfield. The hotel is cosy, the food is good and Retford is a very pleasant little town. We like it a lot. I suppose it is a little bit off the "beaten track", which is probably one of its attractions. The first time we stayed there we visited Sherwood Forest. 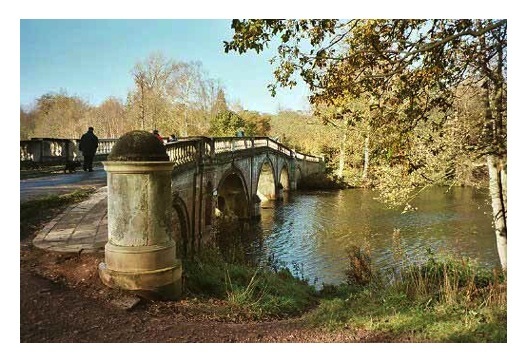 On this occasion we decided to enjoy a walk in Clumber Park, which is situated south west of Retford, is looked after by the National Trust and covers an area of 3,800 acres. The walk was very straightforward. 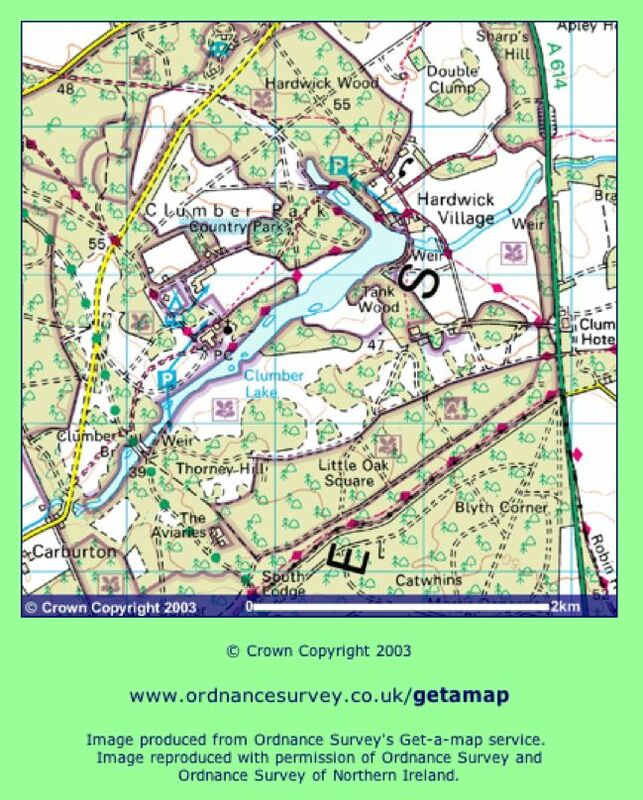 On the Sunday of our stay we parked in the National Trust Car Park near Clumber Chapel on the northwest bank of Clumber Lake. Having walked to the lake we went clockwise around this man made stretch of water. What was the attraction? The water and the trees. And the walk is also very flat and no rain was forecast! Clumber Chapel almost hidden behind the trees. 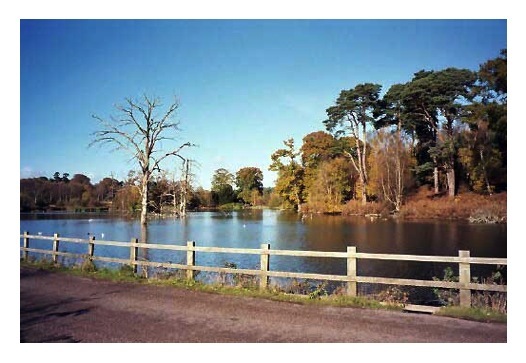 The inlet at the north western end of Clumber Lake. Going north east we initially walked by the lake and then followed a path "inland" towards Hardwick Wood crossing an inlet of the lake on the way. Then it was right (southeast) towards Hardwick Village. And very sleepy it looked on this Sunday morning with the sun shining on it. Looking at Clumber Chapel from the south east bank of Clumber Lake. 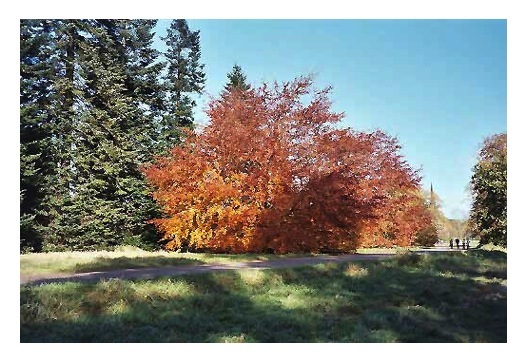 From here it was over the weir outlet of the lake and along the southeast bank with occasional stops to admire the views – namely the chapel and the trees on the opposite side of this very linear lake. The bridge at the south west end of Clumber Lake. At the bridge at the southwest end of the lake we crossed back to the northwest bank and proceeded to walk north east to our starting point. 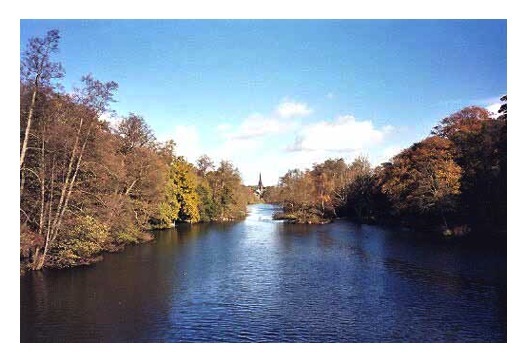 The view from the bridge looking north east up the lake with Clumber Chapel in the distance. Is that short enough Larry? And I hope you like the photographs. What a beautiful big tree. 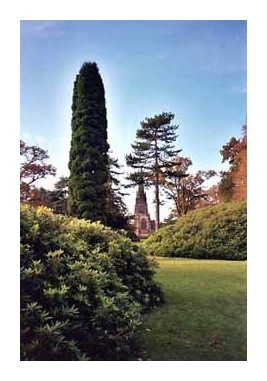 If you want to know more about Clumber Park click here to go onto the appropriate page of the National Trust website.